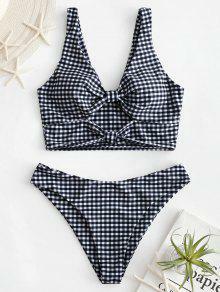 This is a lovely bikini set for those who like to embrace the old fashioned checkered look. The tank style top has two sweet knots which create a keyhole design and an alluring plunging collarline to accentuate your bust. Matching briefs have moderate coverage.